High Number of Migrating Humpback Whales Reported Entangled – Neptune 911! 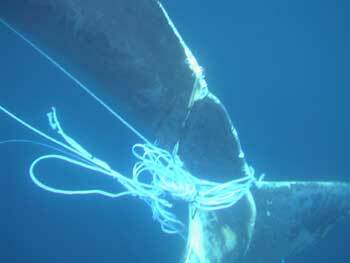 In the first month of the northern migration, about 17 entangled whales were reported. The total for this year is 22, which is higher than any full year between 1990 and 2011 and is the same total as last year. Humpback whales are migrating along the coast to breeding grounds off the state’s north-west. They are primarily becoming entangled in rock lobster fishing gear and this year marks the first time lobster fishers can operate year-round. The Western Rock Lobster Council’s John Harrison says the industry is doing all it can to help the whales. “We’ve got to take into account that this is the first year now of going to a full 12-month fishing season,” he said. Mr Harrison says the extension of the fishing season and an increase in whale populations is contributing to the higher number of entanglements. He says the industry has recently rewritten its code of practice and is working on research projects to help the whales. “We are on the front foot with this, we’re not sitting back on our hands,” he said. “We are doing something and we’re acutely aware that we need to do address this because there is a perception, that we don’t want out there, that we don’t do anything, but I can assure the public that are listening to this that we are.